Two years ago today, we lost our Audrey, just days after finding out she had cancer. I held her and sobbed on the floor of the vet’s office, reeling from the shock. The tumor was under and through her tongue. Completely inoperable, and getting bigger by the day. We’d adopted Audrey from our local city shelter eight years and five months earlier. She was a skinny, meek little puppy, who kissed our Bogie obsessively under his chin when they first met. We took her home and loved her, sitting on a stump in our backyard, going through the names of all the actresses who had ever been in movies with Humphrey Bogart, as she explored her new life. 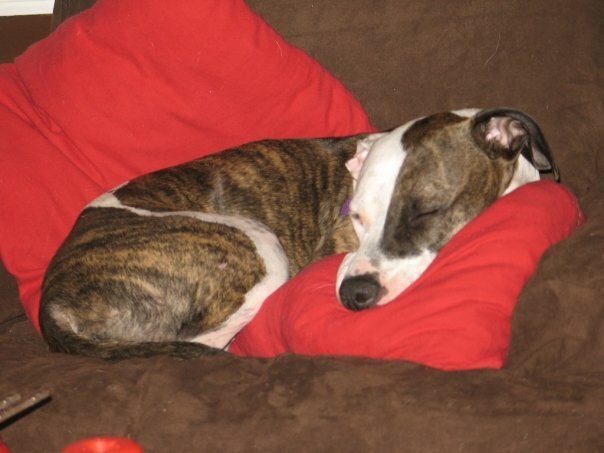 The day after we adopted her, she began vomiting. The emergency vet sent her home after what turned out to be a false negative parvo test. She got sicker and we ended up at another emergency vet, where she stayed for a week. We were able to visit her, but we had to wear gowns and gloves, holding her little bony frame, IV tubing running from her little front leg. Parvo is a rollercoaster. Puppies often get better, only to crash again, but our girl prevailed, despite developing double pneumonia and finally, we were able to bring her home. At night, she slept under the covers. 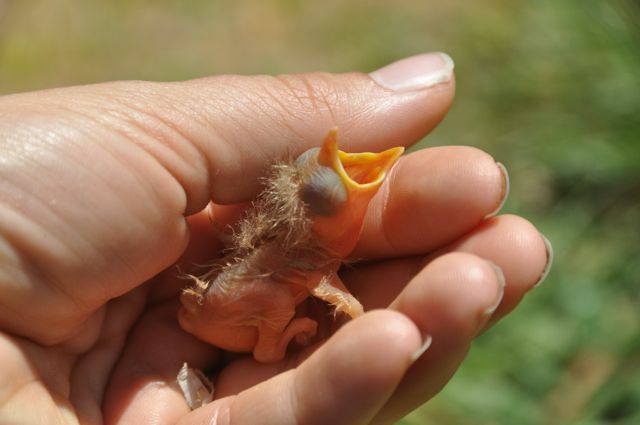 She was so terribly thin, it was physically and emotionally painful to hold her. She licked herself to sleep each night, as she would for the rest of her life, coughing occasionally from somewhere in the crook of our knees. Soon afterwards, with her compromised immune system, she developed demodectic mange. Once she recovered, we had her spayed and returning to the vet to have her stitches removed, she stepped on glass in the parking lot and had to have general anesthesia to have the gaping wound in her paw stitched. Then she ate an unknown amount of prescription medication. We took to calling her our “money pit,” but we said it with much tenderness. 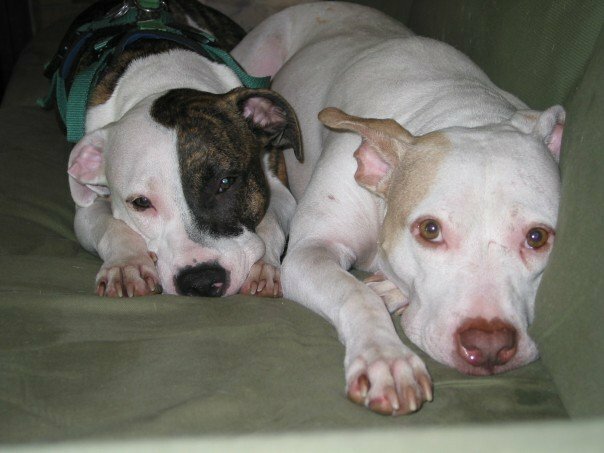 We knew how important socialization was to a puppy of her age, but we had to keep her isolated from other dogs for weeks while she continued to shed parvo. 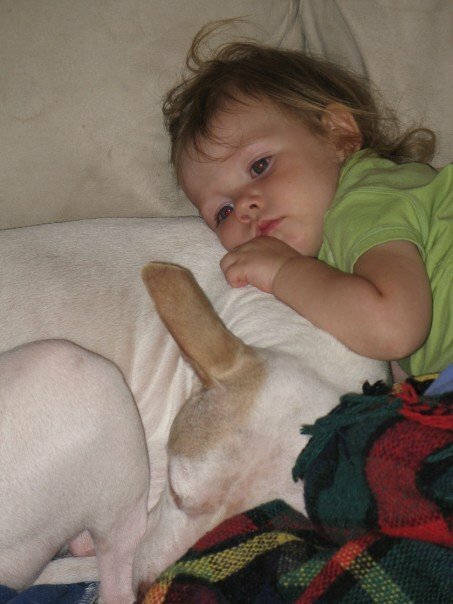 We played socialization CDs of babies crying and loud noises and we hoped that her interactions with Bogie, who had just been titered for parvo immunity, would be enough to keep her dog social. But as she grew, her behavior around dogs left much to be desired. She twisted and howled at the end of the leash when she saw another dog, she got into a handful of dog fights, which were loud and scary, though she never hurt the other dog. She would even jump aggressively onto our Bogie, barking, if the door bell rang. She loved Bogie, though she bullied him. 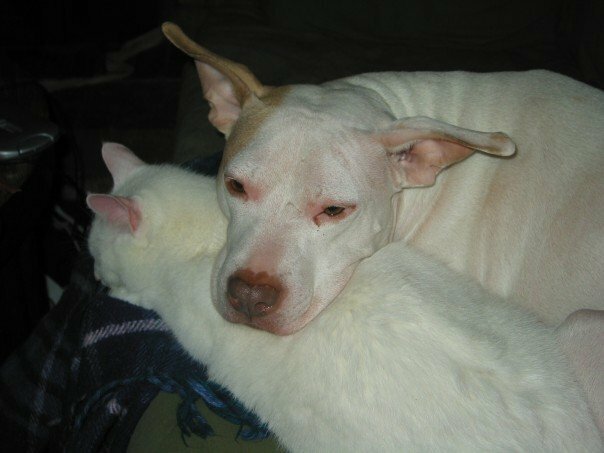 She loved my parents’ dog, and looking back, I think she would have loved puppies. She had a hard time relaxing when we took her places, and that combined with our embarrassment over her antics, our fear of giving pit bulls an even worse reputation since people didn’t know this dog sounding like a banshee on the end of the leash had never hurt a dog, these things made us leave her at home much more than we should have. She deserved better. But oh, her love of people was powerful, and babies and children in particular. 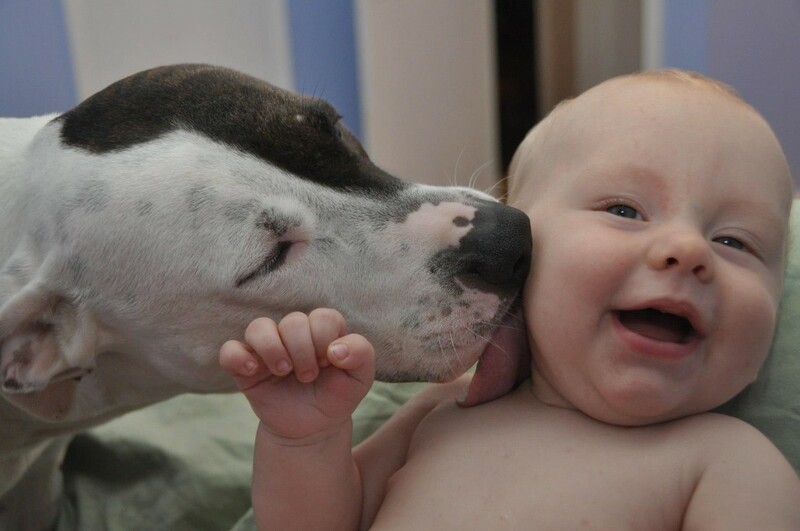 She would sneak around behind anyone holding a baby, not giving up until she’d been able to lick little toes. She was tolerant and patient with children. When a little girl tried to jump over her as she lay sleeping in the shade of a stiflingly hot summer day, and instead came down on Audrey’s ribcage with her full weight, Audrey got up and moved. No growl, no reprimand. 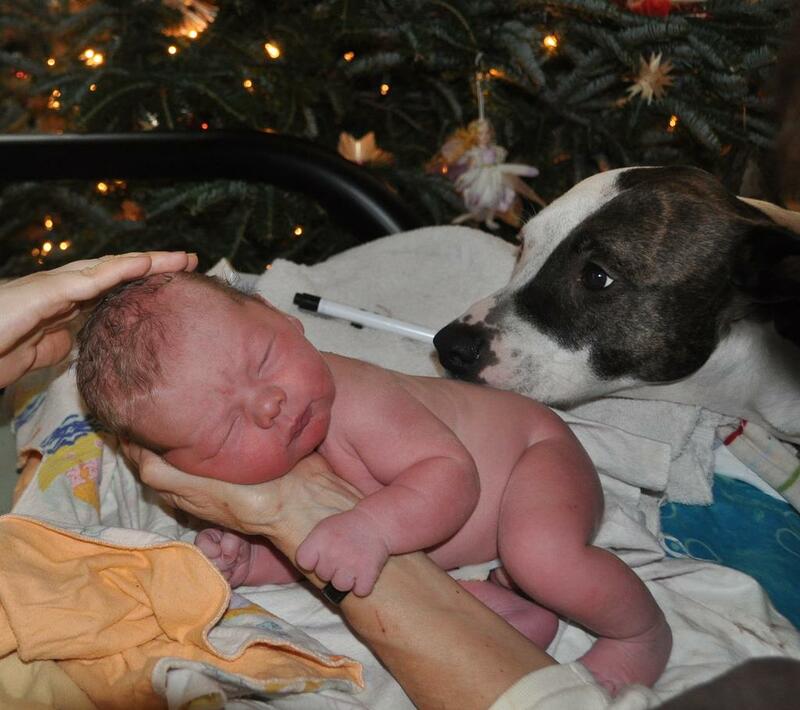 When our third baby was born at home, our midwife arrived a little apprehensive about pit bulls. Three hours later, after our son’s birth, she held him out for Audrey to lick, to welcome. Oh, how she loved my babies, her babies. It was hard having Audrey. It was hard not being able to go on vacation without her making herself sick in our absence. It was hard having a dog so upset about being left alone that she put her paw through our bedroom window and then wagged happily all the way to the vet, gushing blood, but happy to be going along. It was hard not being able to take her places comfortably, and it was hardest of all that people thought she was dangerous when she was so far from it. And oh, it was hard to lose her, at eight, as we had lost Bogie.Our sweet vet came to our house, our friends arrived to take care of the kids, another friend brought Audrey chocolate ice cream. We’d walked with her in the park, let her off the leash to chase squirrels that morning. She was still so completely healthy and full of life everywhere except for that tumor, that growing tumor that made it hard for her to eat. Painful for her to drink. And we thought of Bogie, and of how much he had suffered, and we were relieved that there was no choice for us, relieved there was no chance to fight it because we feared fighting it too long again. 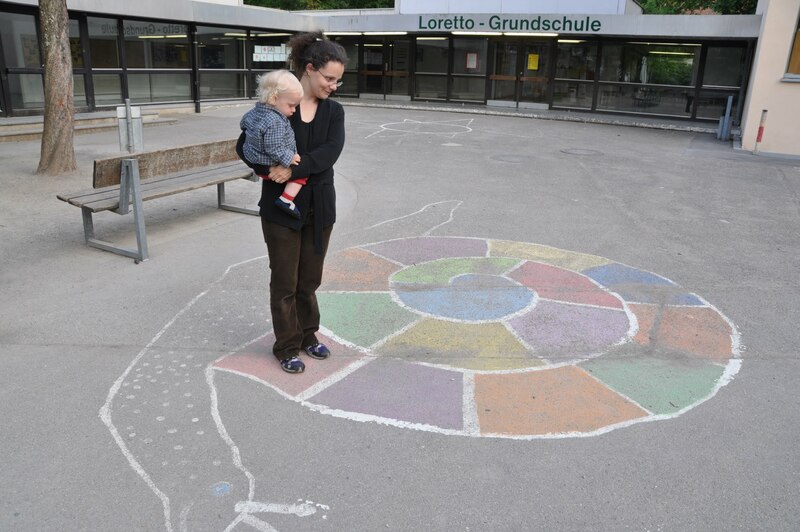 Two years ago, we were getting ready to return to Germany for the first time in eleven years, the first time with children. I lived in Germany for eight years of my childhood, and Tony and I spent our amazing, heartbreakingly beautiful junior year abroad in Berlin. My childhood in Germany was an idyllic one, full of the lantern walks and wooden toys and handcrafts, playing in the rain and the time in nature we typically associate with Waldorf education here. But with the beauty of an idyllic childhood comes the curse of worrying whether my children’s childhoods are measuring up to my own. Their playroom is filled with wooden toys, we walk in the rain, we have a nature table in the corner of our dining room, we even make lanterns some years. Our little piece of Germany in our own home. But it couldn’t compare to taking them to my other world. To my childhood. I watched them climb the wooden rainbow playground Tony and I had seen being built twelve years earlier. We showed them the heavy red door to our apartment building in Berlin, the park where we’d spent our afternoons with Bogie, introduced them to our friends who had known us so long ago. 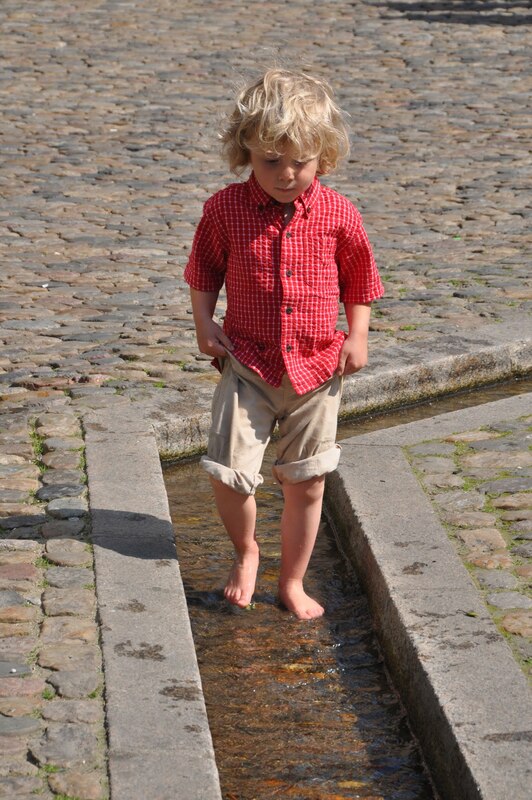 In Freiburg, they waded in the little Bächle running through the cobblestone streets, pulling along their little boats on strings where I had set sail decades earlier. 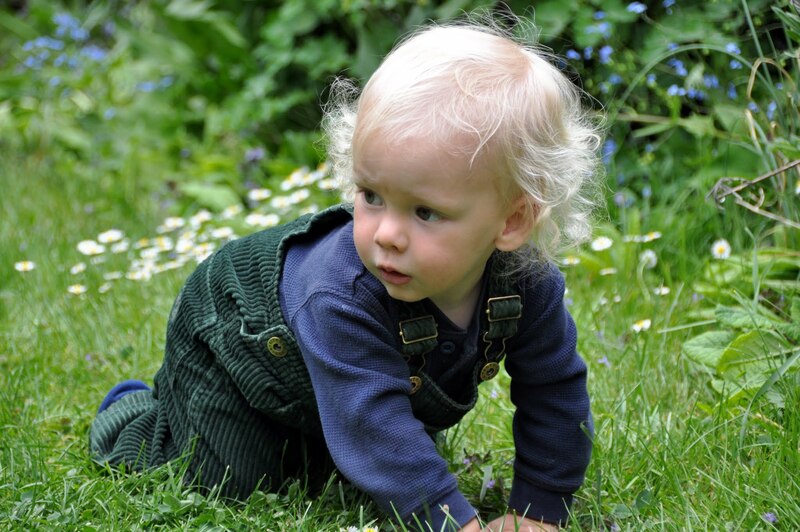 They saw the green door to my home, and the stone wall in the garden, the one I’d climbed so often, the one over which I’d met Georg, with whom we were staying. I watched Georg’s mother set the table before my children with beautiful lilacs and wooden Easter bunnies on her red checked tablecloth, and I was reminded of the flower crowns she wove for me when I was a little girl, and of watching her sew a red checked dress for me on her sewing machine. We hopped along the segments of the snail still painted on the concrete outside my first grade classroom, faded in time and memory. We rode the bright yellow streetcars, and walked across the bridge flying international flags, the one I’d crossed so many times walking to kindergarten. We climbed the 331 steps up the tower of the cathedral where I had spent Christmas Eve, dressed in velvet and shiny black shoes. We explored the marketplace and its beautiful flower stands, and we smelled the pungent smell of olives at the little olive stand that had been my mother’s favorite. And then we boarded the train for Tübingen. Oh, how they loved the trains — regional, super fast, double decker, sleeping compartment — they loved them all, as they did the buses and the streetcars and subways. 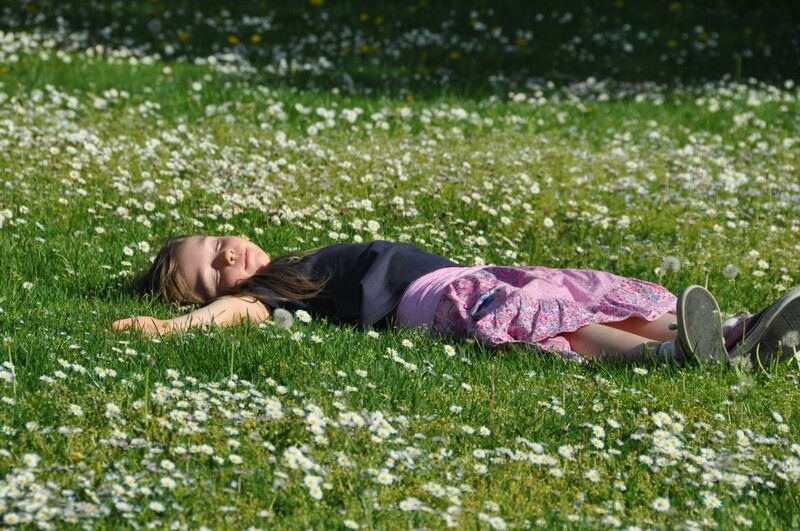 The every day of my childhood that I had taken for granted, was all new and wonderful to them. In Tübingen, we stayed with our family friends in whose house I had spent so many days and nights. I saw my children sitting at the little kitchen table, crafting with the woman who had crafted with me so many years ago. I saw my children climb the apple tree I had climbed, saw them picking flowers for bouquets and lying among the Gänseblümchen (“little goose flowers”) in the garden. I walked with them down the paths I’d walked so often as a child, through the town and the marketplace. 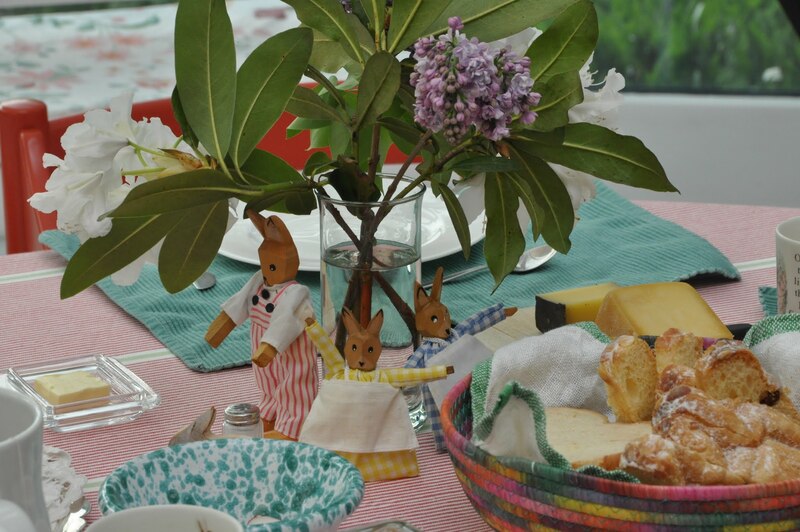 We celebrated Easter at my childhood best friend’s house, and I saw them sit at her parents’ table as I had so often, and I saw them be fed and doted upon as I had been. We rented a row boat and rowed along the river where I had fed ducks as a child. We walked along the Plantanenallee, the peninsula along the middle of the river, with friends who had known their grandparents for over four decades. And these friends swung my children high up into the air between them, as they had done with me when I was little. And it was beautiful. Every minute of seeing my sweet children in my childhood world was absolutely beautiful. But one day, as I sat in Freiburg, nursing my baby in the old botanical gardens, I looked up at the brilliantly blue sky and against the sky, the bright green leaves of a huge chestnut tree, one of many in Freiburg. And it was then I realized, my children still wouldn’t know Germany the way I had. They wouldn’t know Germany in the fall, the sharp stab of pain that comes with opening the prickly green case to reach the shiny brown polished chestnut inside. They wouldn’t know the Christmas markets, or learn to ride their bikes over cobblestones, and I knew, as much as they loved this world of mine, as much as I loved seeing them there, they were merely visitors. And I thought of their childhoods, of what it’s like for them to go to Farm Sanctuary every year, with no adult responsibilities. I thought of what Crooked Island means to them, of swimming in the cold water, hearing the loons call at night, making blueberry pancakes with the berries they picked around the cottage, their grandmother’s cottage, not mine. And I realized, they may be tourists in my childhood, but I am merely a tourist in theirs. Right now, I am thinking about how I was going to write about walking four miles to get here, how my pants would no doubt already be two sizes too big from the sheer exertion. I had it all planned out, what I was going to write. About how I crossed the bridge over the river, sweaty, yet determined, and just how the beautiful late afternoon light looked over the water. But then a mile in, a friend pulled over and asked if he could give me a ride, and I hesitated for the sake of my planned out story, but then I said yes. I’m a meddler, I’ve decided and I should be punished for meddling in my future thoughts. I can remember as a kid, reading about people who studied animals in the wild, ethologists. It sounded so appealing, so perfect for this animal-loving kid I was, but then I read about them not being allowed to meddle. No interfering, even to save one of their beloved animals, their subjects. And so I gave up that dream because I recognized in myself, even then, my inability to leave well enough alone. And so, as I drove through the neighborhood today and saw a flash of white in the mouth of the orange tabby who crossed my path, I sighed and stopped my car. I chased the tabby into someone’s front yard, where he dropped his prize, a little lizard. Alternately, we pounced, cat and I, trying to capture our elusive prey. Finally, I won and cradled the bleeding lizard in my hand as I drove home, where I cared for him and rejoiced in his feistiness when he bit me repeatedly. I released the little lizard on the way here, after the wildlife rehabilitator, the one who would later care for my baby robin, said biting was a good sign. I released him in the park, away from the cats, but not too far into the park, not where I’d seen an owl sitting in the treetops on several afternoons. Not where I saw the owl again today, standing in a creek. 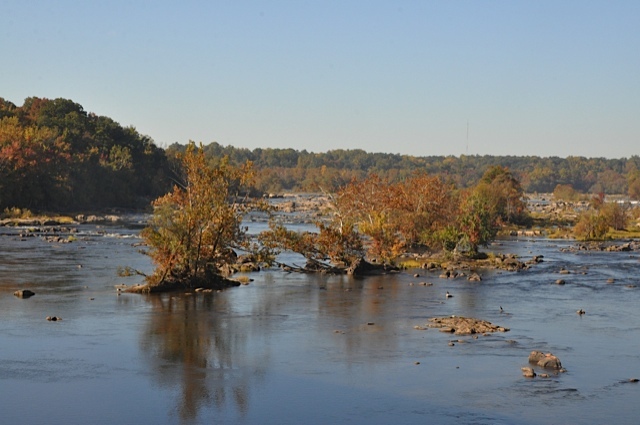 And I sighed because that’s not normal either, an owl standing in a creek in the late afternoon, so I scrambled down the embankment and up he flew, that owl, to a branch above me because he didn’t need my meddling and my self-righteous sigh. He needed me to leave well enough alone. It was a warm April afternoon in 1999. Tony and I were at the shelter, taking pictures of the adoptable animals, as we did every Friday. We were exhausted and filthy as we neared the end of the kennels. But then, in the second to last cage, there he was. Technically, his fur was white, but it was so short, and his belly so bare, he looked more pink than anything. He was overjoyed to see us, as though he’d been waiting for just that moment when our eyes met his. His whole body wagged and wobbled with pleasure, his green eyes blurred with motion, his red watercolor nose pushed towards us, its color spilling onto his surrounding skin. His ears stood out from his head at odd and delightful angles, one straight, one flopped over at the tip. We put the camera aside. He was impossible to photograph in such a state of joyful agitation. Instead, we gave in to his affection. He licked our faces, nibbled our ears, climbed into our laps. As we laughed and hugged and petted him, we noticed he was slowly starting to swell. His face looked even pinker than before and red lumps began appearing all over his body. Tony ran for help, while I stayed behind. He almost died that day, this sweet dog, from an anaphylactic reaction to the vaccine he’d just been given. But he survived. The shelter staff named him Petey, after the Lil’ Rascals’ pit bull, but somehow the name didn’t seem quite right to us. Not that it mattered. After all, we were leaving for our junior year abroad in Berlin in less than a month and we certainly weren’t about to adopt a dog. And yet, there was something about him. Our once or twice weekly shelter trips were replaced by daily visits. As exam time arrived, we dragged our heavy textbooks along to spend long hours studying in the grass, Petey stretched out on his belly, legs extended behind him like a large pink frog. Of course, he couldn’t actually lie in the grass without breaking out in hives — he needed a blanket. Vaccines were just the beginning of his allergic sensibilities. He sneezed violently if we sat downwind of anyone taking a smoke break, the pads of his feet bled if he walked too much on the pavement, and his pink muzzle and ears had to be slathered in baby sunscreen for sensitive skin to prevent both sunburn and rashes. And yet, his physical needs were nothing compared to his emotional ones. Any time he sensed even millimeters of space between himself and the person against whom he was leaning, he stood and circled, plopping down forcefully a little closer than he had been before. His gaze was penetrating. Too much time without direct eye contact from the people he was attempting to charm caused him to stare earnestly until his trembling white shape forced itself out of their peripheral vision and into their center of attention. Our center of attention. Days turned into weeks. The end of the school year approached, bringing closer our departure date for Germany. 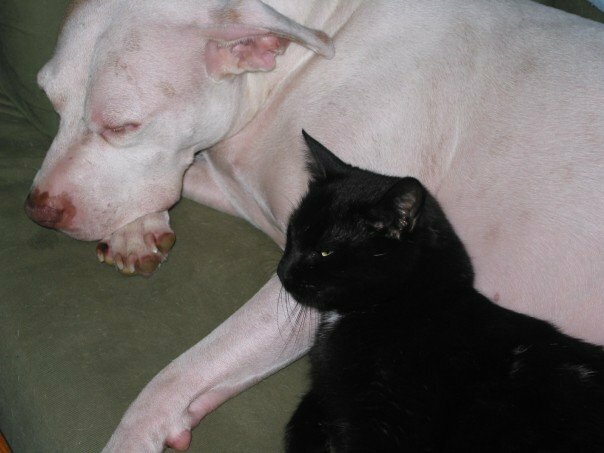 Our days with Petey became shadowed in sadness, until one day the inevitable happened. We decided we couldn’t leave him. Another volunteer offered to keep him for a month while we traveled and found an apartment in Berlin. Our friend Dan, who saw a particular kinship in Petey and his allergic sensibilities, offered to drive him to the airport. Our parents declared us insane. We saw the complications and difficulties multiplying, but we didn’t care. We were elated, we were happy, we were in love. Now that he was ours, we could find the right name for him, too, and we chose Bogart, though he quickly became known as Bogie, or Bogieman, the Boge, the Man, the love of our lives. With him, we explored Berlin; through him, we met our dog park friends, spending long lazy summer afternoons in the park that used to be a no-man’s land between the two Berlin walls. In the winter, we stood huddled in the dark and cold, passing around a thermos of mulled wine, as our dogs orbited around us. That incredible, amazing year we planned to make our reality after graduation. Except for the pit bull ban. We marched with our friends in protest through the Brandenburg Gate, a ridiculous muzzle hanging loosely from our sweet boy’s face, and because of the ban, because the thought of muzzling this sweet boy for the rest of his life was intolerable, we didn’t return. Bogie charmed everyone he ever met. When Tony’s cousin broke up with her boyfriend, he protested, “But I’ll never see Bogie again!” When another cousin had major surgery at a children’s hospital, we convinced the staff Bogie was a very poorly trained therapy dog so he’d be allowed to visit and cheer up James. We kept a kitten we were fostering because despite her terror of us, she fell immediately in love with the big, pink oaf, winding herself around his front legs, purring violently. He was there at our wedding, between us in the photograph of our wedding announcement, as he often slept between us under the covers, his head on one of our pillows. 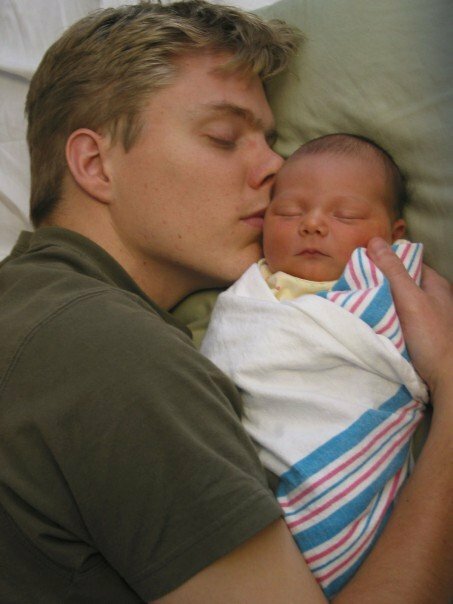 He was there when we brought our first baby home from the hospital. He was definitely always there, underfoot, in the kitchen, when there was food being prepared. The one trick he ever learned was to sneeze and cough on command if we asked “Are you sick?” — a natural progression from the snuffling and snorting he did when a treat was nearby. But then one day, he was sick. We didn’t see it coming. He was only eight years old, and he was so good, to his very core, he couldn’t possibly have cancer. But of course it doesn’t work that way. Suffering and pain and grief are not doled out fairly and proportionately. And he did suffer, in those six months following his diagnosis, as we tried everything imaginable to save his life. I saw him suffering and turned my head away, convinced myself this was temporary because he would get better. He would get better because he was such a part of who we were. He would get better because the baby growing in my belly couldn’t not know him. We didn’t know how to be without him. But then six years ago today, we knew we had lost. We had lost, and we were losing him. On the way to the vet’s office, I panicked. I thought of how he loved food and how he would never eat again. So we stopped for ice cream, and sick as he was, he lay in our laps and licked that ice cream in ecstasy, as he had all those years ago on warm summer afternoons in our park in Berlin. I wish I’d been calmer, as I held him. I wish my declarations of love to him had been less desperate, more gentle, as the life slipped out of him and his body went limp in my arms. I wish I’d been stronger for him, this boy who left us better for having known him, better for having shared his life, but oh, so lost without him. Four years and one month later, we were back in our park again for the first time since we had been there with him. And we were there again with him, with his ashes. And we found a little spot beneath the trees in the birch grove overlooking the park, and there we buried him, in this place where we had really all begun. And we have gone on living. We have had children who do not know him. We have joy in our lives, and we have another sweet dog who reminds us of our Bogieman every day. But we also have the knowledge that we live in a world where suffering is not fairly distributed, not among people, not among animals. We live in a world where dogs like Bogie suffer and die young, and yet, we live in a world in which there are dogs like Bogie. “No snow,” said radio. “No snow,” said television. But snowflakes don’t listen to radio. Snowflakes don’t watch television. All snowflakes know is snow, snow, snow, snow. Every Christmas, my family read London Snow by Paul Theroux (now sadly out of print). In the book, London is blanketed by a snowstorm — unexpectedly, the city is silent, shut down, and beautiful. People are brought together in unexpected ways, as is the magic of snow. What is it about snow days? It’s a free day, a day out of the ordinary. Instead of the endless to do lists, stretching out days and weeks before me, a snow day is filled with simple, necessary tasks — wrangling kids in and out of snowgear, wiping up puddles of melted snow left by discarded boots, making hot chocolate. The world stops and we play, our lives slow down enough for us to notice other people, strangers on the street, whose lives have slowed down along with ours. 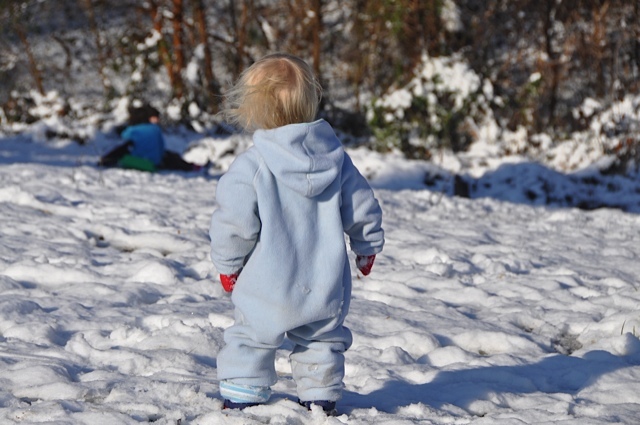 Three years ago, during a large, unusual for us snowstorm, we went to a local park. The hills were covered with people, playing hooky from work, enjoying a day off from school. There was plenty of snow for sledding in a place where we rarely have more than a dusting. Many people didn’t have sleds or winter gear, but they made do. Kids and adults sailed down the hills on plastic storage bin lids, plastic bags rubberbanded over their shoes. Everyone smiled at each other, greeted each other, shared in this extraordinary day. And I thought of London Snow, and of the way things used to be. I remember, as a kid, seeing the first fat flakes of snow falling outside the classroom window, my heart skipping a beat at the hope of an early release. In those days, there was no weather channel, no internet, no twenty varying weather reports from which to choose. By high school, that had changed. My snow days were not filled with day-long sledding and igloo-building. 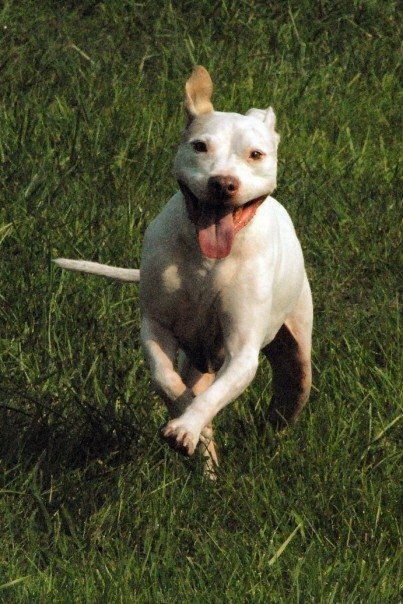 I didn’t take my dog out to track animals who might be in need of my rescue (I never found any, but that didn’t stop me from trying). No, almost as soon as the first snow day was announced, I started obsessively waiting for an announcement about the next, like an addicted gambler, reinvesting her entire jackpot into the next number roll. I was never entirely satisfied, since eventually the snow did melt, the snow days came to an end. And in the meantime, I missed out on the actual snow. Because with the advent of constant tv and internet coverage of the weather, we have gained many opinions, but we have lost the unexpected. We rarely are surprised by snow, at least one of the many meteorologists will have predicted it. We often get less than is anticipated, tending to lose the snow days I’d already planned and hoped for after seeing the extended ten day forecast. I need larger and more unusual storms to get my fix, to feel bonded to others in the same storm. And so, I wonder, am I strong enough to stop looking? To stop following storms on Facebook? Do I really need to know more about the weather than what temperature it is if I go out on my porch? Could I just stop looking and let myself be surprised and happy when I see the first fat flakes falling outside my window? There’s a general buzz of excitement on local blogs and Facebook right now, as there always is when the circus train arrives in town. Families are excitedly planning their circus visits and are anticipating the parade of animals from the train through downtown. And I am profoundly sad. I went to circuses as a child. I remember the excitement, the loud music, the smell of sawdust and popcorn. And I remember the toy whips they were selling one year. I chose a woven purple one because purple was my favorite color. And then I watched the tigers wend their way through the narrow tunnel of cages to the larger cage, where they snarled and swatted at the long black whip smacking loudly in front of them. A friend of mine came home with me from the circus. She wanted to see the purple whip I’d gotten and she smacked it in the air as she’d seen the tiger handler doing. She didn’t mean to, but she hit me with the whip. It struck my leg and my eyes stung with tears. I knew it was an accident, so I tried to hide how much it hurt. I didn’t want her to feel bad. But the sting stayed with me for much of the afternoon, and I thought of the purple whip, the toy whip, so much smaller than the whip that threatened the tigers. The next time I went to the circus was as an adult, a student of animals and public policy, on what the circus claimed was a behind the scenes tour, to show our class of animal welfare students they truly had nothing to hide. But there was no behind the scenes part to our tour — we arrived to find we’d merely been given tickets. One of my classmates recognized a friend, standing in front of the entrance, wearing a sign with a picture of the baby elephant who had died after being forced to perform while sick. She greeted him, hugging him awkwardly around his sign. 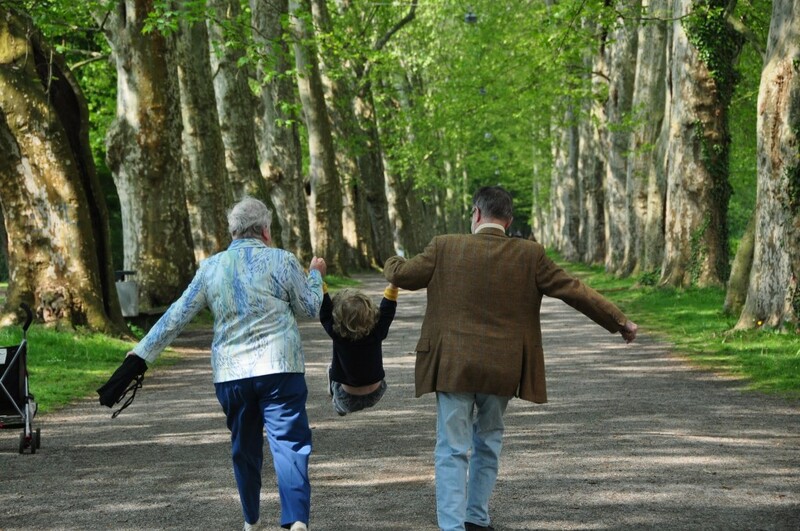 As we turned to go up the stairs, families streamed past us, but we were stopped. And searched. Inside, I smelled the familiar sawdust and popcorn, heard the loud music, felt the excitement of the children around me. I knew so much more than I did when I was a child at the circus. I’d heard the former elephant trainer speak about the brutal training methods, about how the only somewhat safe way to work with a circus elephant is to beat the spirit out of her with a bullhook. I’d learned so much more about the lives of animals in the wild, of their social structure, their emotional connections. And so, when the circus elephants came into the ring, and the music blared “I’m proud to be an American because at least I know I’m free,” as I looked around at the cheering children around me, I felt the sting of that whip again, and I cried. For the elephants, and for the children, who were not cruel, who just didn’t know. Might never know. And I swore in that moment that any children I would bring into this world would know. And their lives would be full and rich with experiences, but a circus with animals would never be one of them. 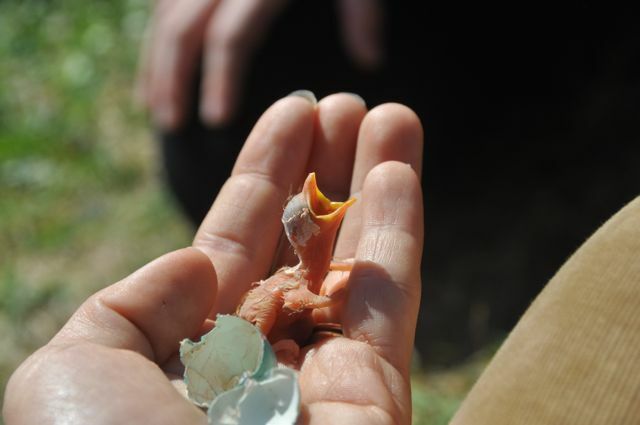 How do you follow a blog post for which you have pictures of a robin hatching from an egg? Not at all, apparently. Last week was rough — a week of unintentionally hurt feelings and a very sick foster cat, sent back home with me and unlikely to make it through the night. “Feed her anything she wants,” the vet had said, and when she refused cat food, both wet and dry, I remembered I had a jar of meat baby food left in my cabinet from when I’d rescued a lizard from the jaws of a neighborhood cat a couple of weeks ago. I offered the jar to Tilly, but she refused. I scraped the contents into her bowl, but again she refused. Only when I scooped up the gelatinous nastiness with my poor, violated vegetarian fingers did she lap it up contentedly. I knew I had to go out for more. CVS had none. I briefly contemplated asking, “Don’t you have any MEAT baby food?” but I couldn’t bring myself to say it, so I drove across the street to the Walgreen’s, and they had it. I gathered four each of chicken and turkey in my arms and got in line. I congratulated him again and started to leave, glancing back one more time to see him leaning against the cash register, smiling and playing tenderly with the hospital band on his wrist. I smiled and felt full, having gotten to witness this new father’s joy. My feelings, petty and real and heavy from the week slid off my shoulders and I felt hope, for this new father and his baby girl and for Tilly, who might live after all, and for me, who got to see such a beautiful raw moment; this new father, working his day job, selling meat baby food to a vegetarian. And I thought of how we do ordinary things every day, when extraordinary things are happening all around us — birth and death and marriage and illness and sorrow and adventures. And in those moments, when our ordinary intersects with someone else’s extraordinary, we find humanity and hope and sameness and beauty. I’ve been wanting to write in this space for such a long time, but I’ve been at a loss for a beginning. I even reread Anne Lamott’s Bird by Bird , in which she tells the story of her writer father helping her brother finish an overwhelming school project on birds. His advice to his son was to just take it “bird by bird,” and that’s how Anne Lamott tells us to write. But I didn’t know which bird should be my beginning. All my stories, all the things I want to share — beginnings, endings, middles, none of them seemed right. I berated myself for spending so much time not getting started on something no one was likely to read anyway. But on Thursday night, after returning home from my writing group, I was again thinking how I still needed that first bird. Just a way to start. And on Friday, I found an extraordinary one, or rather, a little girl found it for me. Friday morning was all about timing. Had my friend not been out of town, we wouldn’t have delayed our usual Thursday morning get together, nor would we have been at the park near my house since Fridays are the one morning I try to stick close to home. I was a little late, as usual, but so was she, which she almost never is. And so, instead of heading for the playground, my daughter walked towards our friends. My son, who would normally have been in preschool during our get together, followed. 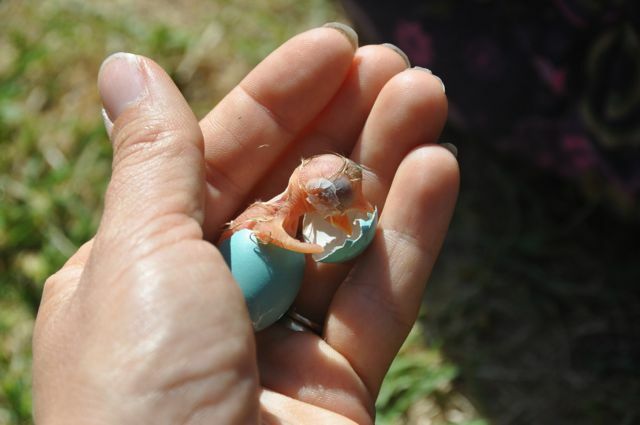 My friend’s daughter, delighted to see him, raced across the grass to meet him, hugging him and lifting him up before letting him go and spotting there, on the ground, a tiny blue robin’s egg. She picked it up, held it for her mother to see, this colorful treasure, and I saw her mother wince as I did, catching a glimpse of the tiny bit of pink flesh, not an empty egg, and the ant, and I knew what it meant as did my friend’s daughter, though she was only four, recoiling and dropping the egg. 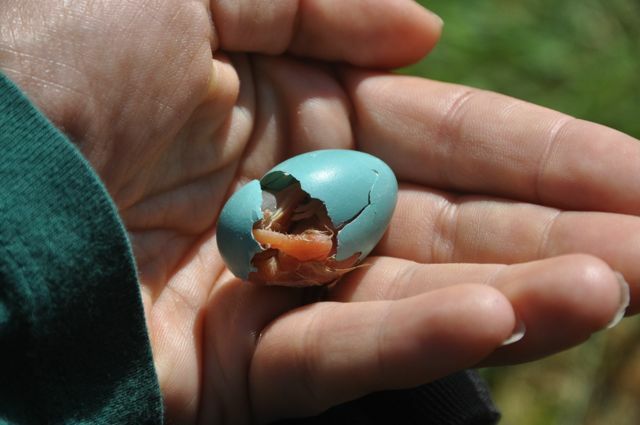 But as the egg hit the ground, it moved more than it should have and I picked it up and brushed away the ants, and saw the tiny bit of pink flesh straining against the crack in the turquoise shell. So many little, trivial reasons had brought us to him at just that moment, reaching him before the ants overpowered him. 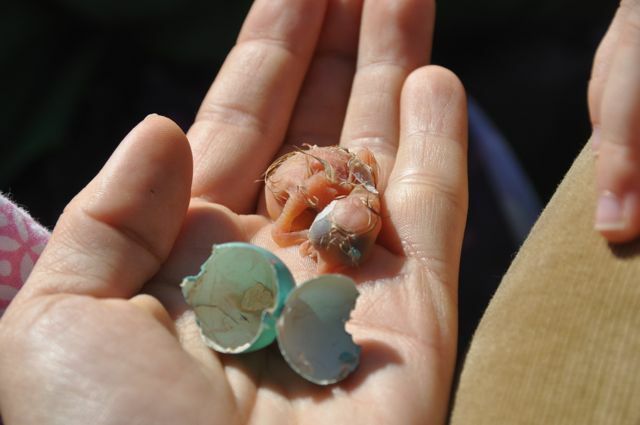 After searching in vain for a nest, I called the wildlife rehabilitator, the one I’d called earlier that week about the lizard I wrestled from a cat, and she asked me a lot of questions, not quite believing the little pink creature inside the egg was really alive in there, not quite believing I wasn’t mistaken as all other people have been who have called her claiming the same . I wasn’t mistaken. 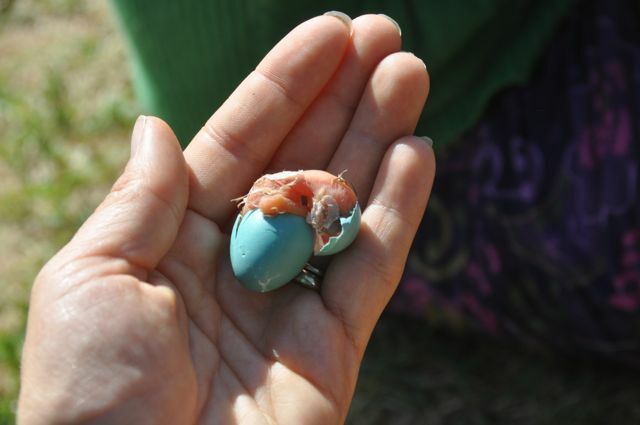 I held this little turquoise egg in my hand, watching as the little being inside strained and rested, strained and rested with the work of birth. I saw the crack enlarge with each strain until finally, the little naked baby burst forth, mouth open wide and hungry. Finding no regurgitated earthworms, he settled into my hand to rest, his few tufts of fluff drying blonde in the sun. 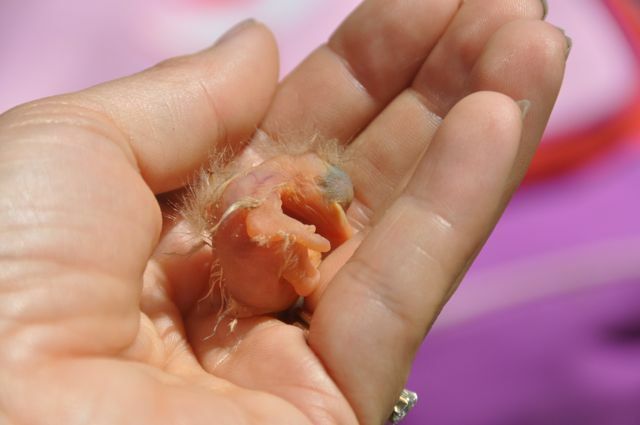 And I heard his first chirp, and I heard my daughter say, as I had once said, “Baby birds are so ugly, they’re cute,” but I looked at this naked, pink baby with his blonde fluff and his not yet open eyes, nestled in my hand, and I could find nothing ugly about him. I had the honor of holding this sweet little soul, but I knew I wasn’t experienced enough to give him his best chance at life, fragile yet strong as he was, so I only held him long enough for an experienced wildlife rehabilitator from Area Rehabbers Klub to come and pick him up. Against all odds for such a little guy, he is thriving in her skilled care, and we’re hoping all his strength and determination to survive continues. 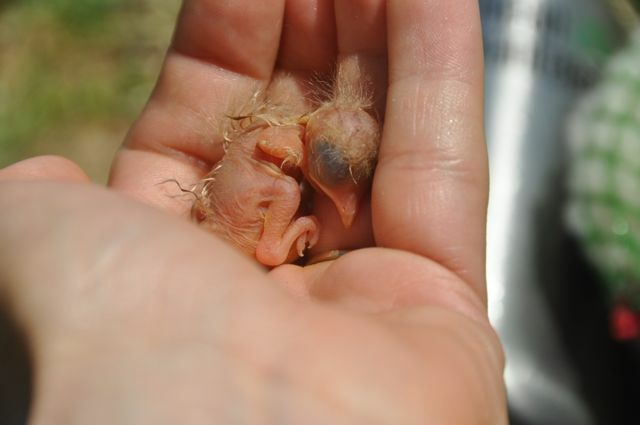 I am so grateful to the many wildlife rehabilitators who dedicate so many hours, day and night, to give orphaned and injured wildlife a chance at life.